Feadship has revealed its latest Future Concept at the Monaco Yacht Show, a glass-focussed 86m superyacht design inspired by the new Dutch King Willem-Alexander and his Queen Máxima. Each year the prestigious yard produces a radical superyacht design for an imagined client. The exercise is intended to, ‘make the boundaries a bit wider for everyone – owners, designers and our own engineers,’ says Tanno Weeder, a senior designer at Feadship. Last year the yard chose Einstein as its client, this year it was the royal couple, to mark the year of the King’s coronation. The Feadship Royale concept was designed to serve as both a comfortable family home on sea and a state yacht suitable for hosting dignitaries and holding receptions. The yard realised these requirements by reflecting on the personalities of the royal couple, incorporating them into the design. The broad sweep of glass extends diagonally from the aft of the bridge deck to the lower deck at the bow, transparent in certain areas and opaque in others, depending on intended use. Areas focused on official state use include a vast main aft deck and entrance hall, as well as a drive-through tender dock on the lower deck. Once a dignitary’s tender has arrived, the port and starboard doors can be closed to allow them to step on to the adjacent beach club in privacy. It is a far more discreet entrance than arriving at the platform aft of the main deck, especially if a party is in full swing there. The royal family’s private apartments lie forward on the main deck and feature a central family saloon, with four cabins lying off it. Forward, at the very tip of the bow, is a two storey ‘hide-out’ with wrap around windows. The lower deck part of the hideout is at water level. ‘If dolphins were here it would be spectacular,’ says Weeder. The design may appear outlandish, but the yard is confident that a full-height glass superstructure is technically possible, now that ovens of the size required to bend giant glass panels are available. The Feadship Royale would be powered by two Rim drive thrusters of 1,500kW each, offering a top speed of 17 knots and a transatlantic range. 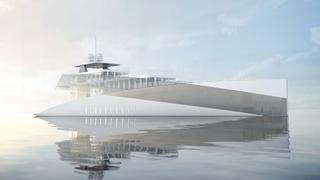 The design would accommodate five people in the owners’ quarters, eight guests and 22 crew.